Birthdays are one of the most expensive yearly celebrations, but that doesn’t mean you can’t find birthday freebies – everything from free food to gift cards. While these won’t work as a replacement gift, it’s a nice way to treat yourself or someone you know on their birthday free of charge. We’ve broken down these birthday freebies into 10 categories so you can easily find what you’re looking for. The great thing about gift cards and coupons is that you can spend them any way you like. Benihana restaurant offers the most popular birthday gift card promotion - a $30 birthday certificate when you register for Chef’s Table. Meanwhile, Don Pablo’s offers a $10 gift card on your birthday, while Ace Hardware will give you a free $5 coupon when you sign up for their Rewards program. Free food and coupons are pretty nice, but what about free merchandise? While these freebies are more difficult to come by, there are several places where you can sign up to receive a free gift for your birthday. Movies freebies are quite rare, but we did find a few. Harkins Movie theaters offer free popcorn on your birthday. Meanwhile, if you become a member of Disney’s Movie Rewards program, you receive 100 points for free on your birthday. Outside of movies, there are several other entertainment freebies you can get. One awesome offer is free admission to Medieval Times Dinner & Tournament – a medieval theme dinner theatre which includes jousting and sword fighting tournaments. Another neat offer is free bowling at AMF Bowling and other birthday promotions. This is certainly one of the more unusual freebies – birthday songs. Unlike commercial music, these songs are completely free to use, download and share. 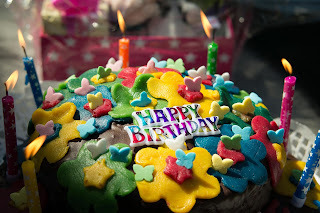 For example, 1happybirthday.com allows you to create personalized birthday songs that will actually use the name you’ve chosen. You can listen to the song, download it, or send it to a friend. Meanwhile, if you’re in the mood for birthday music, check out this totally free album with 140 birthday tracks. The freebies we’ve discussed above are either online promotions, or span across multiple states and countries. But what about freebies that are specific to your local area and aren’t found anywhere else? Thankfully, there is a website that helps with just that. On BirthdayFreebies.com you can enter your city and find birthday freebies that are specific to that one place. Better yet, the website is not limited to the United States and also lists freebies for Great Britain and parts of Canada.